Blogs for Teens – Library Success: a best practices wiki is a list of library blogs by, for, or about teens. Teens @ CCPL&IC has just been added. Now you can check out teen happenings at libraries across the country, and then come back here, of course! If you see anything neat, new, or interesting that you think would be great for our library…leave a comment. Have a great day and remember to keep reading! 3176 teens participated in our library’s summer reading club. 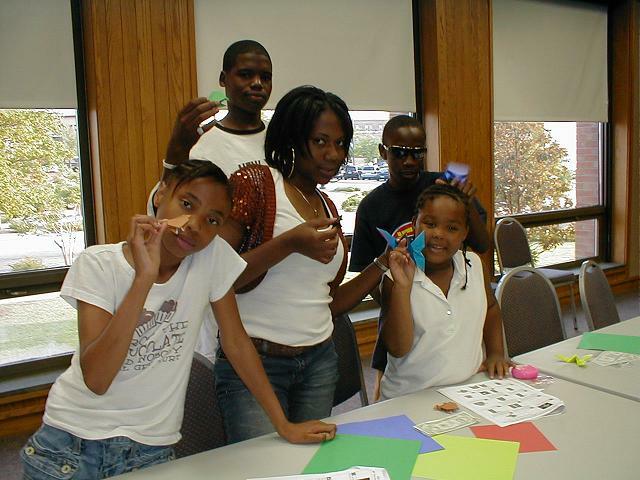 2176 teens attended at least one of 55 programs hosted by the six branches and Headquarters library. Over 6000 books were read…wow, that’s a lot of books! Using only strips of colored tissue paper, thinned-glue, and their imaginations, teens created striking works of art destined to hold that most precious of commodities: CANDY! 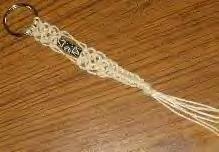 The teens had fun making necklaces, bracelets and key chains out of hemp twine and beads. Some teens worked independently, following a printed pattern, and a group of us worked together on making the same project so we could help each other keep our knots straight. 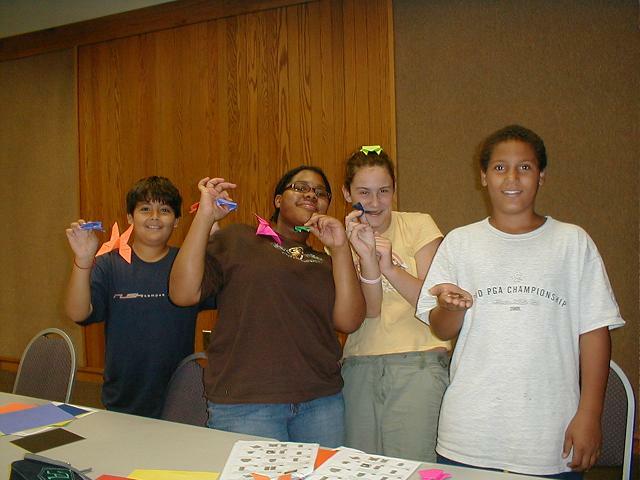 Teens, and a couple of brave parents, learned how to make origami models including butterflies, ninja stars, and cranes. The most popular model was definitely the jumping frog…there were contests to see who could make their creation jump furthest. 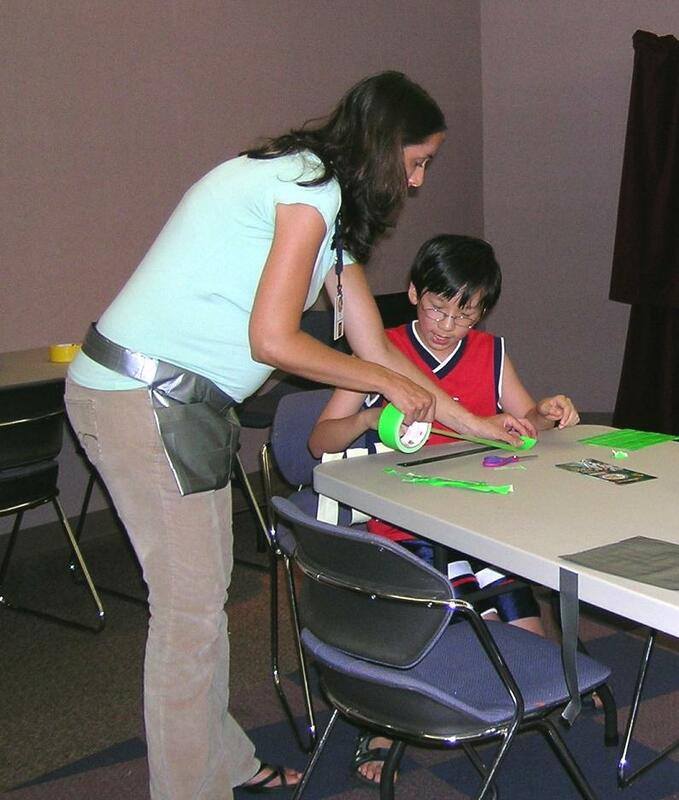 Teens learned techniques for making various objects out of duct tape. 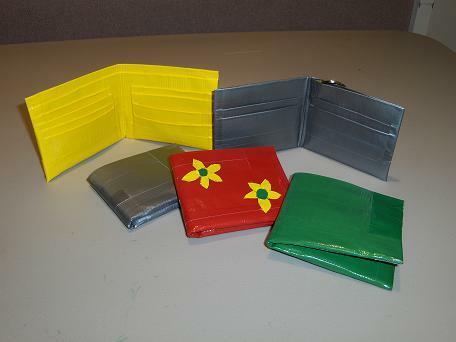 Those with patience made neat, serviceable, and good-looking wallets from the selection of gray and brightly colored tapes. 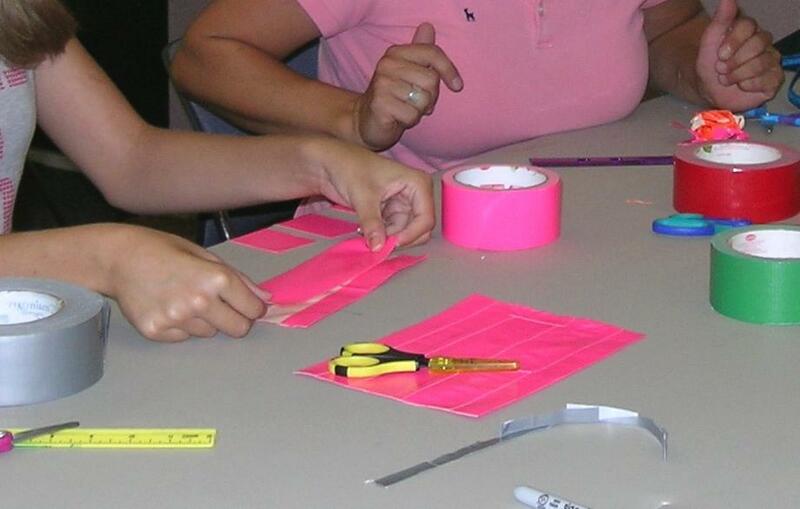 Those without patience made sticky, less useful wallets, but had a great deal of fun doing so. 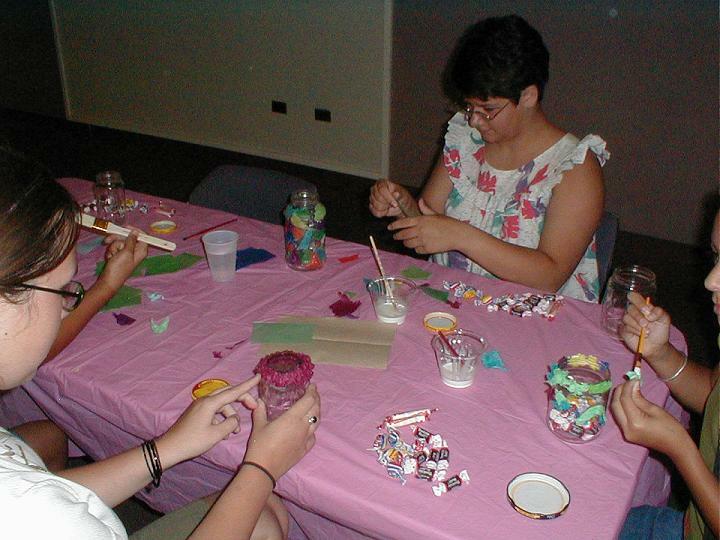 Please check out the calendar of events for more teen craft programs. 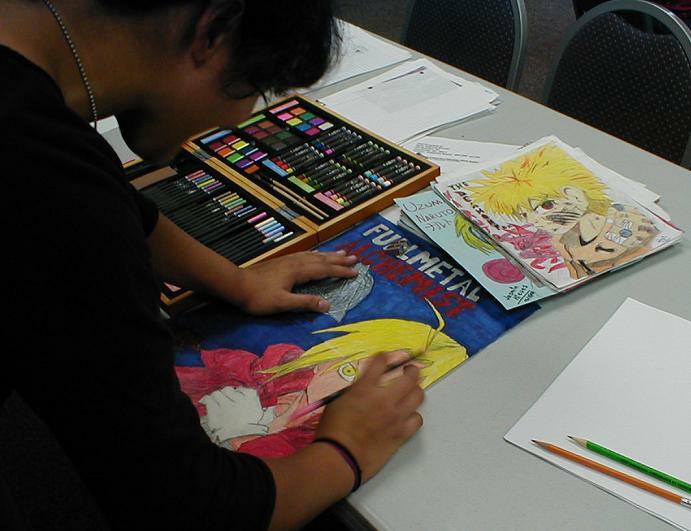 Local manga artists, members of Anime Arsenal Entertainment, gave presentations to teens about pursuing careers as graphic novelists. Teens shared their works-in-progress and their portfolios, and got advice about their general art technique. Teens watched the anime Black Cat featuring Sven, a sweeper, a.k.a. bounty hunter, who is always down on his luck, haunted by the perpetual grumbling of his stomach and looking to make enough cash just to get by. Oh, and he can see the future, but only about five minutes into it. While enjoying the show, teens multitasked, drawing their favorite characters, riffling through freebies and giveaways, discussing the upcoming Librari-Con, and ardently defending their favorite series. 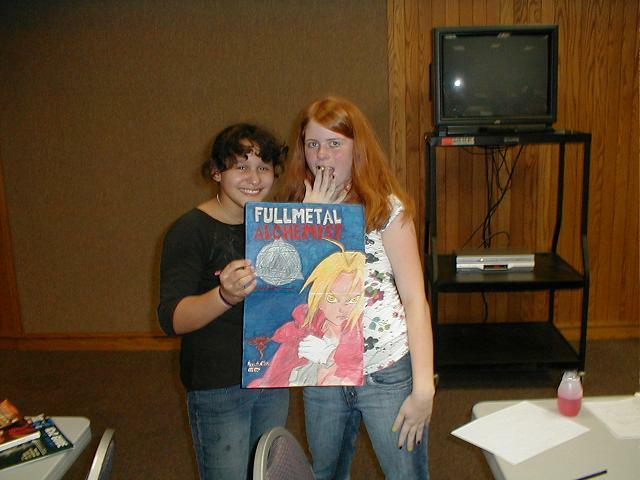 This event is hosted by the Cumberland County Public Library & Information Center and sponsored in part by The East Coast Anime Society (E.C.A.S. ), with participation by Anime Arsenal Entertainment. For additional information, contact Melissa at (910) 483-7727 ext. 306 and stay tuned to the calendar of events for more information. If you’re feeling adventurous check out the unofficial website created by the E.C.A.S.